Looking for a car wash near you? Check out our great list of car wash locations. Select your state & place of residence. The web server used by Carwashlocations.net is run by GoDaddy.com, LLC and is located in Scottsdale, USA. There are many websites run by this web server. The operator uses this server for many hosting clients. In total there are at least 18,480 websites on this server. The language of these websites is mostly english. Only a few websites on this web server are x-rated. 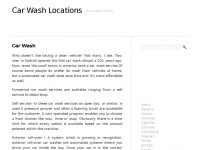 A Apache server hosts the websites of Carwashlocations.net. XHTML 1.0 Transitional is used as markup language on the webpages. Indexing the data of the website and following hyperlinks on it is explicitly allowed by robot information.